Houston, TX – BARC plans to KILL these kittens so the mother cat can be spayed. This represents exactly what is WRONG with BARC i.e leadership who is content to save a few and kill the rest. Leadership who has REFUSED to RIGOROUSLY implement all of the programs and services that are working to save all healthy and treatable pets, such as these tiny kittens. Enough is enough. BARC KILLED over 7,700 pets in 2015 alone. When will the mayor HIRE LEADERSHIP for BARC who will actually work to save ALL lives not just some of them? Here is the mayor’s contact information. Please TELL HIM to hire shelter leadership for BARC who will work hard to end shelter killing. Here is a link to contact information for the mayor and all city council members. If you can foster this cat & her babies, please email: BARC.Aid@houstontx.gov. Of course, that will not stop BARC from killing litters of kittens tomorrow, and the next day and the next…..
Only hiring shelter leadership that is dedicated to saving lives will do that. PETA is still in very hot water over its support of Breed Specific Legislation and is trying mightily to spin the truth. But the truth is the truth, we must keep our focus on it. And when you dig deep into the way their actions impact companion animals you can see that they have one common thread — animals end up dead. The Voters’ Guide for animal lovers! Take it with you to the polls! Houston, TX – This city election could be a turning point in the high kill rates in Houston’s shelters. So, before you vote, learn which candidates truly care about this issue and who are willing to work to implement the programs that have been proven to end shelter killing across the US. There are some great candidate choices in the VOTERS’ GUIDE created by Houston Voters For Companion Animals which is posted on their website here. Make sure to take the Voters’ Guide with you when you vote, and forward it to all of your animal loving friends and family. Let’s make sure that we all vote for the candidates who truly care about this issue and who are willing to work to implement the programs that are successfully working across the country! *Only 13% of registered voters in Houston actually voted in the local elections last year. If all 2.2 million Houstonians were registered to vote, that means only 286,000 people voted in Houston. *65% of Americans have pets. That equals roughly 1,430,000 Houstonians who have pets. 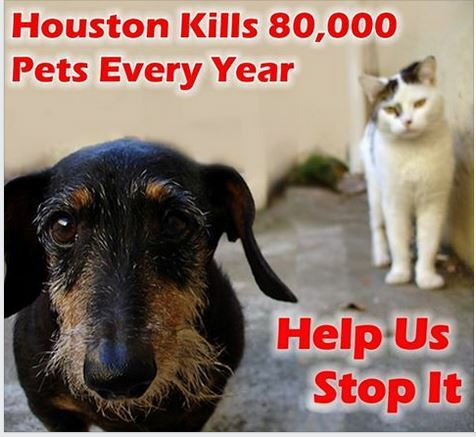 *Compare less than 286,000 Houston voters to 1,430,000 animal loving Houstonians. As you can see it would be very easy for animal lovers to swing an election in favor of shelter pets if we join together and vote for the candidates who represent our values, and who are committed to ending the senseless killing of shelter pets. EARLY VOTING started today and runs through October 31st. ELECTION DAY is Tuesday, November 3rd. Click here to download the Voter’s Guide.